Score This Amazing Beauty Deal at Nordstrom! Every now and then Nordstrom runs these incredible beauty promotions and they're truly not to be missed! This GWP even includes goodies for guys, so the man in your life doesn't have to miss out on the fun (or, more likely, you'll have more stuff to foist upon him). It also includes a sample of Prevage (not the night cream though), so if you've been curious about it, this is a perfect way to test it out without the investment. 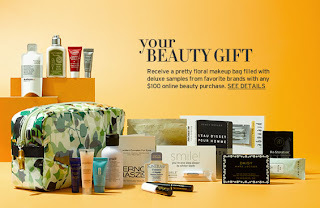 Click here to shop Beauty at Nordstrom and snag this gift! It's only available for a limited time, so make it snappy.